WASHINGTON — As technicians pore over the results of a recent successful missile defense test over the Pacific Ocean, they will be paying close attention to data from an interceptor whose launch served a secondary test objective, an industry official involved in the exercise said. The ship-based interceptor, a Raytheon-built Standard Missile (SM)-3 Block 1B, was the second of two launched at a short-range target Sept. 18 from the Pacific Missile Test Range on Kauai, Hawaii. The first interceptor hit its mark, while the second passed through the resulting debris cloud. While previous missile defense tests have launched multiple interceptors at different targets or from different locations, this test marked the first time a single ship launched two SM-3s against the same target, which officials say more closely resembles an operational scenario. Raytheon officials stressed that a U.S. Navy ship equipped with the Aegis Ballistic Missile Defense System and SM-3 interceptors would not fire just once at an incoming missile. “This capability enables additional engagement opportunities, allowing for a ‘shoot-assess-shoot’ layered missile defense if necessary,” a Raytheon press release said. In a report released a year ago, a U.S. National Research Council identified what it characterized as the “shoot-look-shoot” capability as critical to maximizing the probably of hitting an incoming missile. But the authoritative study also said that capability would require better integration of data from sensors aboard interceptors into the MDA’s battle management systems. 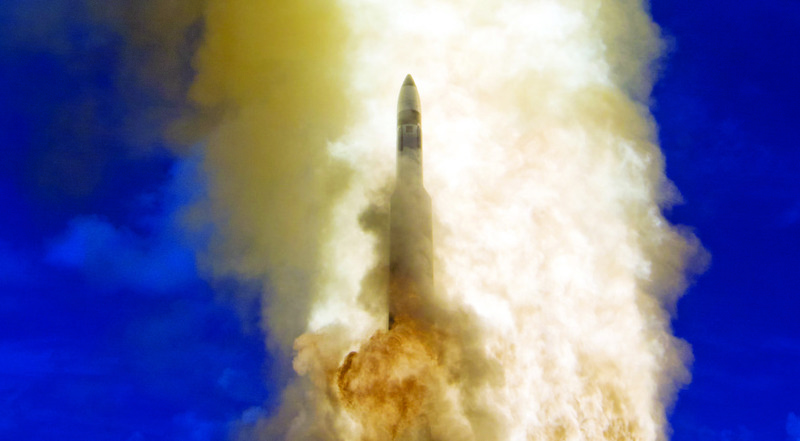 Data from the second interceptor launched in the Sept. 18 test will provide information such as how a second SM-3 would navigate through debris in the face of a multilayered missile attack, missile defense experts said. It is also part of a long-term strategy at the Missile Defense Agency, “part of the evolution of shooting at more sophisticated targets,” Stevison said. Riki Ellison, founder and chairman of the Missile Defense Advocacy Alliance, a nonprofit here, said the second interceptor provides a “great opportunity” to look at the debris field and help pinpoint exactly what the interceptor is looking at, whether it be a piece of debris, a decoy, or another missile. Richard Lehner, a spokesman for the MDA, said the agency had previously completed tests to verify interceptor performance in debris clouds. For the latest test, MDA experts “were interested to see how the system reacted to having a missile’s target destroyed while in flight, and in the opposite case, verify how the system behaved if the first shot did not complete an intercept,” he said. The test also marked the highest-altitude intercept using an SM-3 missile, Stevison said. Officials said the intercept took place at a higher altitude than many satellites orbit, thus demonstrating the SM-3’s ability to defend wider swaths of territory. ‘We have now proven we can take the SM-3 to even higher altitudes,” Stevison said. The SM-3 Block 1B is a more advanced variant of the Raytheon-built SM-3 interceptor currently deployed operationally aboard Navy ships. At press time, another more complicated, test involving the SM-3 Block 1B was said to be imminent. That test will help determine whether Raytheon is ready to begin full-rate production of the interceptor. Meanwhile, in an announcement tied to the test, Raytheon executives said the company has finished building a key component for the ninth AN/TPY-2 X-band missile tracking radar for the radar. The antenna equipment unit is one of the four major components to the radar and ensures Raytheon will deliver the radar early next year, a press release said.